Does It Matter What Type of Camera You Shoot With? Take a look at the above images. Could you tell what type of camera each one of these was shot with? Is the camera more important than the composition? At Shutter Tours, we think it is more important to see what is around your environment as opposed to what is around your neck. What we try to accomplish, is to break down composition to small bite size pieces with examples we have shot on the tour route. As some say, there are no rules in photography and if that’s the case, then why is equipment a major “Focus.” Who knows? But I am usually one to ask the questions when photography questions pop up… “So whaddya shoot with?”. Maybe it’s a good icebreaker, or it’s a status symbol like driving a car. I have almost always shot with Nikon and am better versed in the features of their models. Our guides Valentina and Kristi, shoot with Nikon and Canon. Does it matter?… not really. Unless you are getting to the finer points of shooting that requires a step up in knowledge. When developing our tour, we felt it was really important to stress the composition aspect of photography to help our guests build a base for their future travels and photography pursuits. Most of us started out with the basics and through trial and error, built our skills by continuous shooting and feedback from others. We like to think that we are giving you a head start with some solid advice when reading a website or page in a book, cannot always accomplish this. I spoke with one of our recent tour participants to get her feedback. Christine realized that she was able to actually “see” what was around her as opposed to just looking at what was around her. There is a big difference, in that you start to engage with the environment and focus on little things that you may not normally see. Christine shared that after the tour she was excited, yet felt a bit overloaded at what she was seeing, Though she is in the city of Seattle every day, she was missing things that become interesting with a new perspective. Even if you don’t take our tour, we challenge you to start looking around your daily life and look at the different ways to compose the scenes in your mind’s eye. This is always a good way to develop the skills to help you with your photography. I usually have a camera in my pocket wherever I go. A point and shoot are fine, and some our tour participants show up with the simple point and shoot digitals. We even had an adult show up with a simple disposable camera. Challenge yourself to shoot every day, whether it’s with an SLR, point, and shoot or cell phone. So getting back to the images above, any idea what they were shot with? 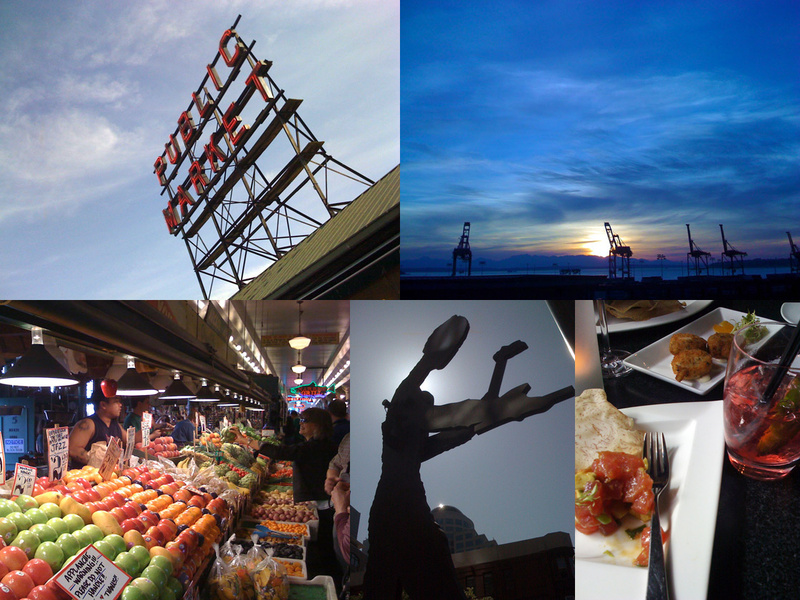 You experts out there might see the difference in tonal quality from the fruit stand to the sunset, to the food photo. Nikon? Canon? Panasonic? Hard to tell, isn’t it? Ah, but I think we’re gonna make you work for this one. This entry was posted in Announcements and tagged camera brand, composition, sightseeing, travel photography. Bookmark the permalink.